Cultivating vibrant communities guided by competent, hope filled leaders. 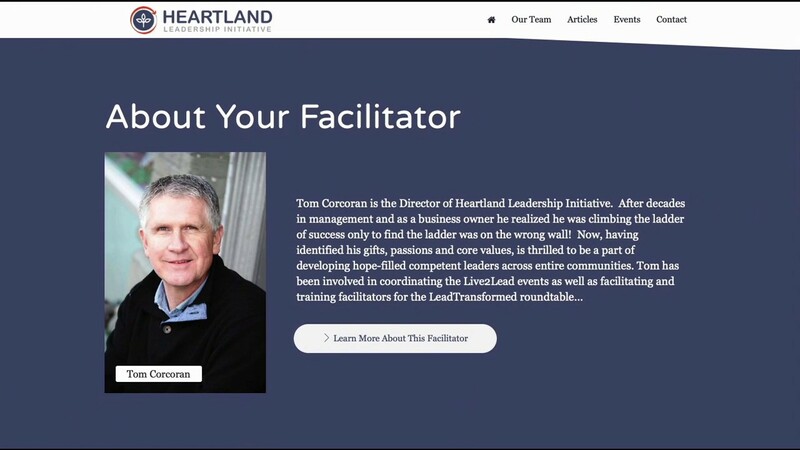 Heartland Leadership provides leadership instruction through events and roundtable discussion groups to support individuals in fulfilling the purpose they were created for. The primary way they facilitate this is through a six month mastermind called Lead Transformed groups. Our goal was to provide a platform for event registration, LT group registration, conditional displays for when group registration opens, and content capabilities for written, podcast and video media. This sites clean design makes it easy to register for groups, learn about your coaches and discover specifics about events in a conversational tone. Our Favorite Part? The super clean and modern design. A simple idea, but one of our favorite parts. Lead Transformed groups provide a circular learning process and they wanted this communicated visually. We recognized our need to streamline our leadership roundtable registration and payment systems, as well as bring clarity and consistency to our web presence. However, we shied away from initiating due to the perceived pain of diving into a world we were not well-versed in. The combination of relational and technical expertise of the Reach Co, dispelled the false perceptions a gave us a solid path ( yet not void of work) to run on. Thanks for helping draw out and execute on the best elements of Heartland Leadership Initiative. Together we have increased the impact of leadership in Central Wisconsin. We created custom event layouts based on the type of event being offered. What that means is that a group layout looks different than a conference layout. The video highlights what an event layout for a Lead Transformed Group looks like.